The birthday celebration continues. We left today for TRF, rather than waiting until Friday. Kyle had heard about this little pub in The Woodlands, and had informed me opening weekend of faire, that he wanted to visit the place on his birthday weekend. So, I put it on the calendar, we made plans to take friends along with us, and we made it happen. Kyle and I got to faire, unloaded the stuff and then loaded up three beautiful women: Roxy, Damaris and Kelly. That’s when the rain really got intense. It had been raining most of the day (most of the week, too, I think) and we knew it was supposed to quit before the weekend. But, I, at least, didn’t realize it was to get so much more violent before it ran its course! Kyle drove us from faire to The Woodlands in some awful rain and strong, high wind. We got there safely, and while there, the rain did finally peter out. The place is very nice, if a little off the beaten path. It is in a modern setting—not what I’d expected, but that’s okay—and it is designed and decorated within to recreate a little pub in the UK that was demolished to make way for a motorway expansion. Apparently, a couple of Americans with money had fallen in love with the place, and when they found out it was closing and being torn down, they made a deal to buy the contents of the pub. We are unclear as to just how much of the interior of this Texas place is original to the British pub, but we know for sure the bar and barback are from across the pond. 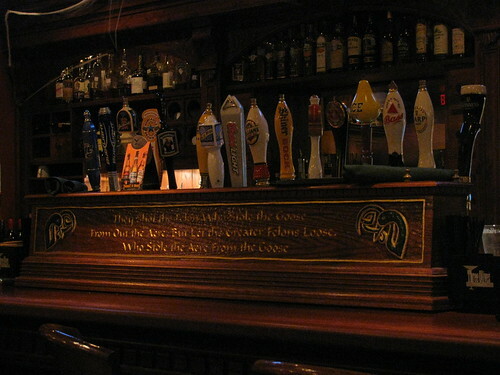 My photo is of the amazing array of taps on the front of the bar—very British in style. We had a wonderful time—good food, good beer and great company in a delightful setting. And the drive back to faire was smooth and quick in comparison with the first leg of the trip. So, birthday celebration day #2 was a wonderful success. Happy Mabon! Celebrate the Autumnal Equinox! 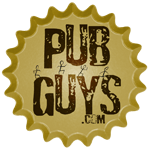 The Pub Guys rock! And, I’m married to one of them! I got to attend my first Pub Guys recording session tonight! I worked at home all day, and couldn’t wait for this evening to arrive. I have been proud of everything these guys have done and was really looking forward to seeing them in action. I had intended to take photos for them, too. But, somehow, once I was there, and I said my greetings to Trista and to Curtis (the PG in attendance), I got caught up in the fun of it, and never even thought about my camera! 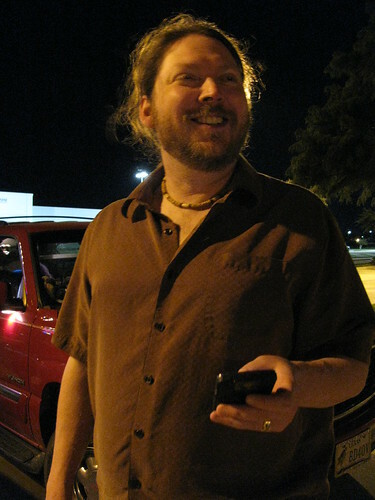 In fact, I even got invited to use a mic at one point, and added to the discussion. It seems my still-evolving NFL boycott had been a topic of conversation before my arrival, and they wanted to hear it from my point of view. I should probably write all about it, so I can see my words and be forced to re-read them until I understand my own feelings better . . . but, hearing myself on the next PubCast might just serve the same purpose! Anyway, I thoroughly enjoyed my time there with the Pub Guys, even if I did smell like smoke when we left. I also managed to get dinner at Abuelo’s out of it afterward! Curtis joined Kyle and I for some Mexican yumminess and a margarita. It was on the way out of the restaurant that I first realized my photographic laziness, and I snapped this photo of Kyle in the parking lot. Not as crisp as I would have wished, but wow, is it a great capture of my guy! My Pub Guy! I’m proud of you, honey. When O’Dwyer’s shut down, my primary motivation in finding a new watering hole, was darts & Guinness. 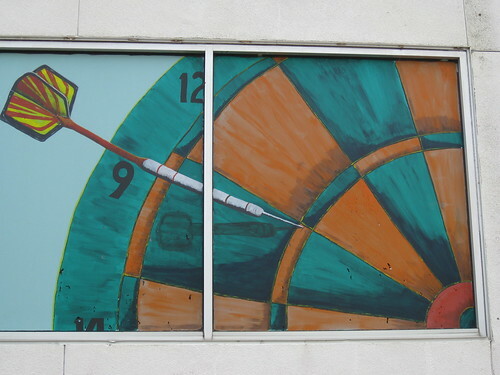 I found the Darts at Rob’s, my regular, based on this sign painted on an exterior window. But, oddly, I’ve never tossed a single dart in the joint. My game is pool, now, and I’m happy with that. Goodness. Is it possible for Indian food to hurt more the day after? Unequivocally I can tell you, yes! Oh, my. Never again, I say. This was a much longer day at the office. We finally had a little bit of speed to the network. Our constant complaining had finally gotten some food into the hamsters that drive the wheels that run the network. They were running a little faster today, thank goodness. We trained some more people, and this time we were actually able to transmit data successfully and look at the results on the website. Hooray! We worked later into the evening and never really managed a lunch break either, due to the sheer amount of work left in comparison to the amount we hadn’t been able to get done. We finally met with the trainer and trained him for an hour and a half. Not long enough, but it’ll have to do for now. We also trained a batch of other folk that seemed eager to be trained – how refreshing. Finally, closing in on 7:30 p.m., we departed. 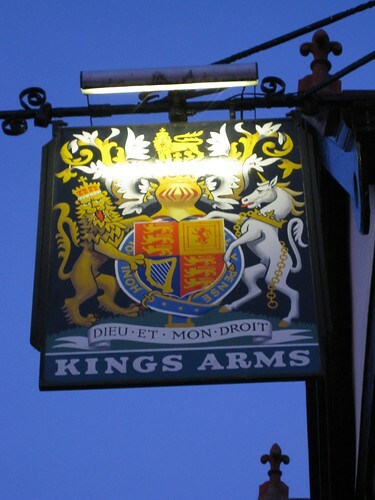 We drove only slightly out of the way and had dinner at a quaint place called The King’s Arms. Nice enough, but unremarkable, really. Off to the hotel for an early night. I was knackered and still in a bit of distress from that Indian food. Never again. Really. The day broke for me with the knowledge that that evening I was going to experience something I’ve wanted to experience for 20 years and never had been able. 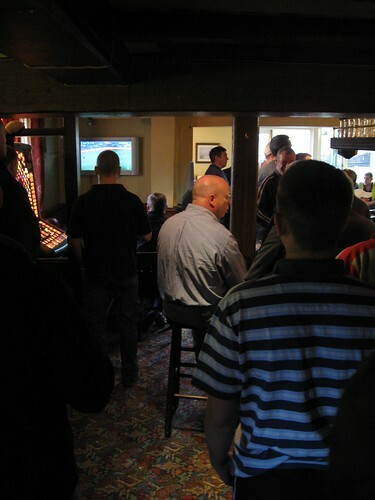 I was going to watch the England International Squad play in a do-or-die match while in an English Pub surrounded by a people who live and die by their football heroes. The day was interminably long. Once again, we couldn’t get our work done because of the network traffic, so after training a precious few folk, we headed back to the hotel so we could buy a ridiculously expensive, but blessedly fast, internet connection. Now, we could get some reports done and emails answered and generally catch up to where we should have been. We finished out the day there and waited for one of the folks at the office to come get us. We actually watched kick-off of this incredibly important match in the hotel lobby. A few minutes later, our ride got there and we headed off into the small village where we were to watch the match. We arrived at Ye Olde George to find that they weren’t showing the match (WHAT!? ), but hell, it’d be rude not to, so we all had a pint each and a bag of crisps. Someone bought me a pint of Bombadier. Oh my, what a tasty bitter that was. We finished up, got in our vehicles and headed to another pub, the Golden Cross. We arrived at half-time. It seemed to be my lot…that is, to only see the second half of these games. Here, they were out of all the beers I’d never had, so the wonderful ol’ standby, Guinness came to the rescue. There I stood in The Golden Cross in England with an Irish Stout in my hands watching the Three Lions of England play the Bears of Russia. What an experience. It was, to me, exhilarating and worth the wait. Sadly, on the day, the boys didn’t do so well, and Russia came away the winners in a droll 2-1 match. Miracles must happen for England to qualify now for the Euro 2008. After this wonderful event, Terrill & I were hungry and it was only 6:45pm or so. So, our ride kindly dropped us off at the (again) King William IV where we had a snack and a pint. We then walked over to the Crown (again) because Terrill really wanted me to meet this wonderful Indian lady that had treated him so well his previous trip. While there she treated us to a small tour of her facilities, including a trip downstairs to the tap room. She also drove home to us just how damaging the Third Runway for London Heathrow Airport was going to be to this community. If the Third Runway is approved (it is almost assured), then all of these little pubs and houses are going to be demolished for the sake of progress. I see both sides of the story, but it’s heartbreaking nonetheless. This wonderful person will have her dreams, her savings and her livelihood smashed into tiny shards. For what? To ease the congestion of the world’s busiest airport? That’s exactly what will happen. There will be no more Crown, there will be no more King William IV, there will be no more Holiday Inn (the latter, I must admit to not being overly upset about). They will all be part of a tax and revenue-yielding conglomerate that will make London even more cosmopolitan than it already is. From this rending story, we left and got some more food. This time, I yielded to Terrill’s overwhelming need for a curry. Never again. I ate some sort of shrimp thing that caused me an immense amount of heartburn and other discomfort all night and into the next day. I’ve tried Indian food again and again over the years. Never again. My hair stunk, my clothes stunk and I hurt. Indian food and I just don’t get along. That’s okay. There’s plenty of food out there I do like, and can eat without inordinate pain or discomfort. That’s important. After that meal, I was done. Back to the hotel and to sleep.